On Friday, Gulliver and I did a quick little bourbon trip that bourbon enthusiasts consider routine. I'm on the weekly marketing email list for several of the better liquor stores around town, and one of them, Pearson's, had some things that caught my eye this week. This week Pearson's received their shipment of single barrel Jefferson's Presidential Select 18. I've very much enjoyed this bourbon over the past year or so--It markets itself as being "aged in Stitzel-Weller barrels" which has lead everyone to believe that this is S-W juice (the same as older Pappy). I think it drinks the same way, so I don't see any reason why that wouldn't be the case. The odd way of marketing it--aged in S-W barrels--makes me wonder though. Why not just say "This is S-W bourbon"? Anyhow. I already have a bottle of it in my bunker, so I passed, but Gulliver picked up another bottle of it for his. Gulliver loves that stuff. He's got a few bottles in his bunker. The store was also doing an E.H. Taylor line tasting, so we stuck around for that. We tasted the small batch, single barrel and the rye. I preferred the small batch, and Gulliver preferred the single barrel. We both knew more about bourbon than the representative pouring the whiskey, but we mostly kept our mouth shut and just enjoyed the whiskey. We had a few more minutes to kill so we walked over to a place next door tastefully named Bourbon. Bourbon had an excellent selection of high end and hard to find bourbon. I had pours of the 2010 Parker's Heritage Collection wheated bourbon and an Eagle Rare 101 that is no longer in production. Gulliver had Elijah Craig 18, which is not in production now, and a PHC 2010. We both though the PHC 2010 was the star of the show. Wheater Wednesday, Van Winkle "Lot B"
Note: Wheater Wednesday is a result of a massive blind wheated bourbon tasting that recently concluded. All bourbons here are publicly available. 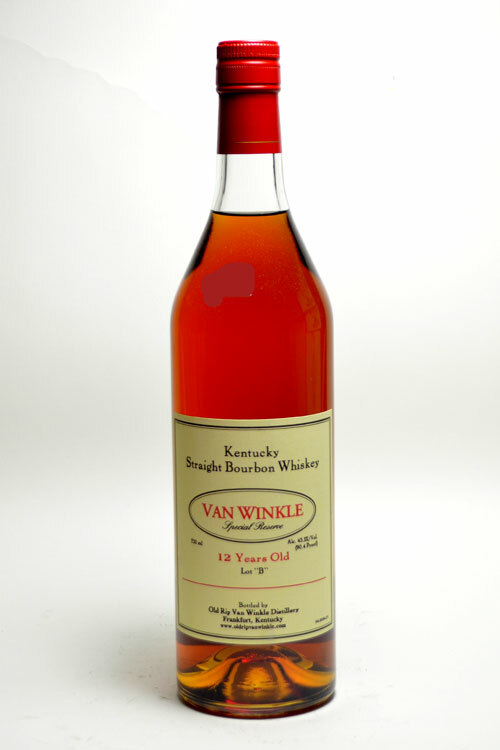 Van Winkle is quickly becoming the most famous name in bourbon--or at least the most sought after. (As any whiskey blogger can tell you, writing about Pappy Van Winkle is a quick way to boost your traffic stats.) The "Lot B" version is a 12 year old whiskey bottled at 90.4 proof. Two years ago I received a bottle as a gift, but since then (and that bottle is LONG gone) I've not been able to find any at a reasonable price. Nose: Caramel, some vanilla and barrel char. Some richness here. Taste: Disappointingly thin and watery. Doesn't live up to the nose. Musty, not a whole lot stood out here for me. Some nice sweetness but it is in the background. Okay, but unremarkable. Finish: Mild spice, but rather short. Overall: I scored this an 80. I think this is perfect example of something being overrated because if its name. It's not bad, but there's better wheaters out there and they're almost all easier to find. On Saturday morning, Gulliver and I played a round of golf at one of our favorite courses in Maryland. As is our tradition, we did some bourbon hunting after the round. We sort of try to keep an open mind--we look for dusties and hard to find bottles. The Washington, DC market for bourbon is, well, insane. The best-stocked stores have recognized the whiskey bubble, and over the last couple of years they've raised prices on the hardest to find bottles by up to 100%. I've seen the BTAC for $149.99, Parker's Heritage for $120, and some older Willett bottles for well over $200. And don't even try to find Pappy--my local store I visit most often is selling "Lot B" for $129.99. The suggested retail price of "Lot B" is somewhere around $40-$50. So after the round, Gulliver and I hit a couple of liquor stores. The first was a den of miserable human existence that included off-track betting and cheap, handle sized whiskey. I thought we might be able to find a dusty or two there, but no dice. We did, however, find a bottle of Old Fitzgerald with a misspelling on the back. We drove down the street a little bit and hit the bourbon jackpot. 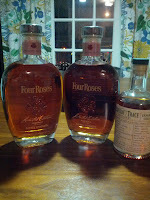 The store had Stagg, Weller, and the rest of the BTAC, as well as 2011 and 2012 versions of the Four Roses Limited Edition Small Batch. 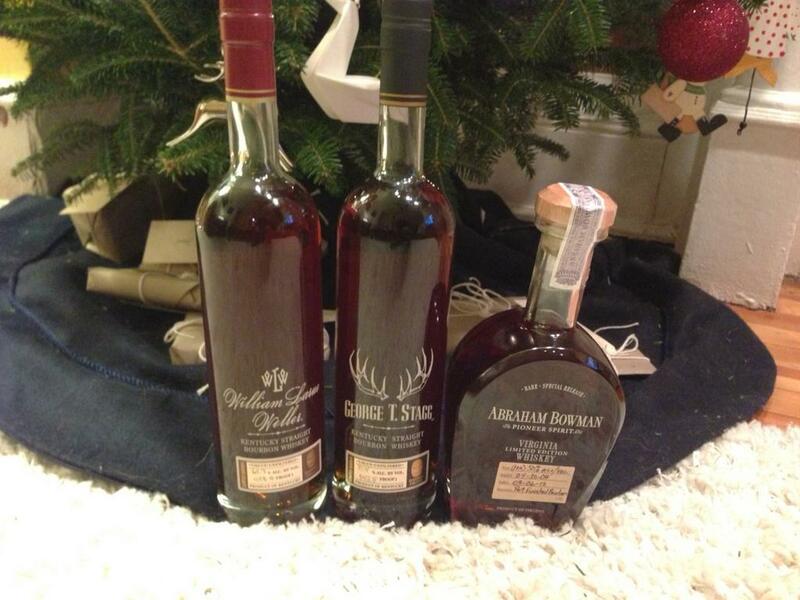 These bottles are all well over $100 in DC, but we were able to get them at or below $79.99. Gulliver added an Abraham Bowman Port finished and I also picked up a Buffalo Trace Experimental Collection 19 year old French oak. All and all, even though our golf games sucked, our bourbon game was excellent. We were able to snag some great whiskey at fair prices. And these days, that is almost asking too much.